Application: It is suitable for installing ships on international voyages. Amendment, LSA and MSC.218 (82). After throw-over from ship, the life-raft can be inflated and opened automatically. If the ship sinks very fast and the life-raft can not be thrown-over, the raft still can float up from water under the action of Hydrostatic Release Unit and can be inflated and opened automatically. The installation height is 18-30m from water surface. Looking for ideal Throw-Over Type Inflatable Life Raft Manufacturer & supplier ? We have a wide selection at great prices to help you get creative. All the Marine Self Inflating Life Raft are quality guaranteed. 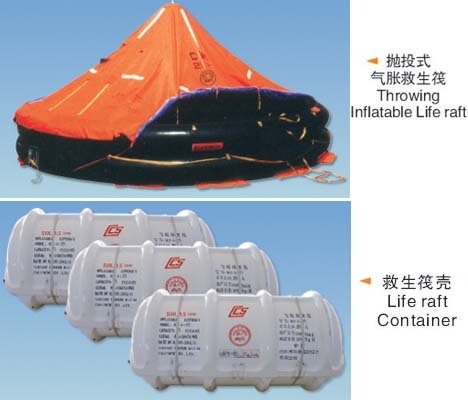 We are China Origin Factory of SOLAS Approved Life Rafts. If you have any question, please feel free to contact us.